Elise Gaudet Element Cycling & Multisport Ltd. I've been involved in triathlon for over 25 year in many roles: as an athlete, a coach and a business owner. 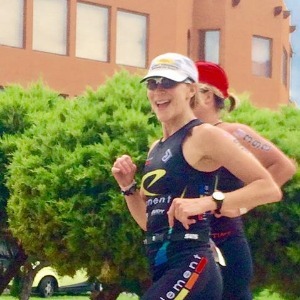 I've coached athletes from beginner to experienced triathletes, sprint distance to Ironman, one-on-one custom programs to group training session. With 14 Ironman finishes (including 3 in Kona) and one remarkable DNF, I also have dozens of other races finishes, long and short. I may have gotten into triathlon rather accidentally but I believe in training with purpose and quality. I started triathlon training quite accidentally, just hanging out with friends who were active and always trying new things. At the time, we were just flying by the seat of our pants. In 1993, we had many questions but few places to find answers. Fast forward to now and we've found a more cognizant approach to triathlon and that's what we are here to share. This sport has grown into a mature business but at its core, its simply swimming, biking and running. Just keep moving. Elise has also successfully earned a Certificate in Sports Nutrition (March, 2013). I've been a competitive triathlete almost as long as I remember. Okay, so it's only been 25 years. Still love it and I will probably never get over the joy of just rust riding my bike, running in a wooded trail or swimming in open water. When in full race prep mode, though, it's time to get serious and make the best use of time: identify your goal(s), make a plan to help you achieve your goals, define the steps and the workouts necessary to execute the plan and then do the work. It sounds simple but life can get in the way. We have to be able to roll with the punches and make it work. This is wear experience counts and those are the challenges I love. I enjoy working with my clients to help them get the best out of their efforts. Success. Coach Elise Gaudet has been notified of your message.